The £150 to £200 price point for the sports glove market is a very competitive group, with every major manufacturer having at least one contender in the mix. For this review we look at perhaps the most unconventional of the group, the Knox Handroid. I’ll start with what is perhaps the Handroid’s first weakness – the fit and feel. I’ve given these gloves plenty of time to break in and despite this they still lack comfort, the fingers don’t fit as nicely as my other brands and the external armour and features do make them feel quite bulky when on. Dexterity wise the Handroids don’t limit movement at all. The only time I have had a problem was on my road bike I’ve had the Exoskeleton fingers catch on the underside of my levers as I moved from a full bar grip to reaching for the levers. This never bothered me on track but I did notice it quite a few times with more lazy day-to-day riding, it’s not a deal breaker but may be worth checking if you have your levers set closer to the bar. The extra palm slider can be a problem for some when riding but I’ve never noticed any discomfort from them; other manufacturers opt for soft leather palm slider rather than polymer sliders or a combination of the two. 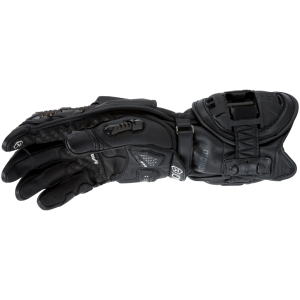 The Handroid have two polymer scaphoid palm sliders for no compromise protection, other manufacturers have thick leather or smaller palm sliders, which after a few crashes are normally the first area to fail on my gloves, not so on the Handroids. 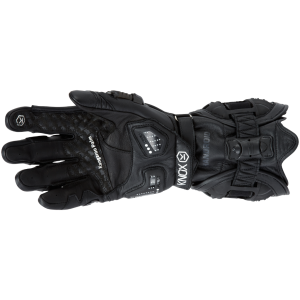 On a day-to-day basis the feature that affects you the most is the Boa fastening system, exclusive to Knox for the Motorcycle glove market. Replacing the conventional Velcro system on other brands the gauntlet is secured by turning the Boa dial, typically from fully loose to a secure feeling is a little slower than just pulling over a Velcro gauntlet. Once on though the Boa system gives a uniform closure with no pressure points, I find as the gauntlet is worn over the sleeve of my leather I don’t notice the extra comfort. Day to day I’d still choose my other conventional gloves over the Handroids as I find them overall more comfortable and a lot less bulky to chuck in a rucksack when not in use. 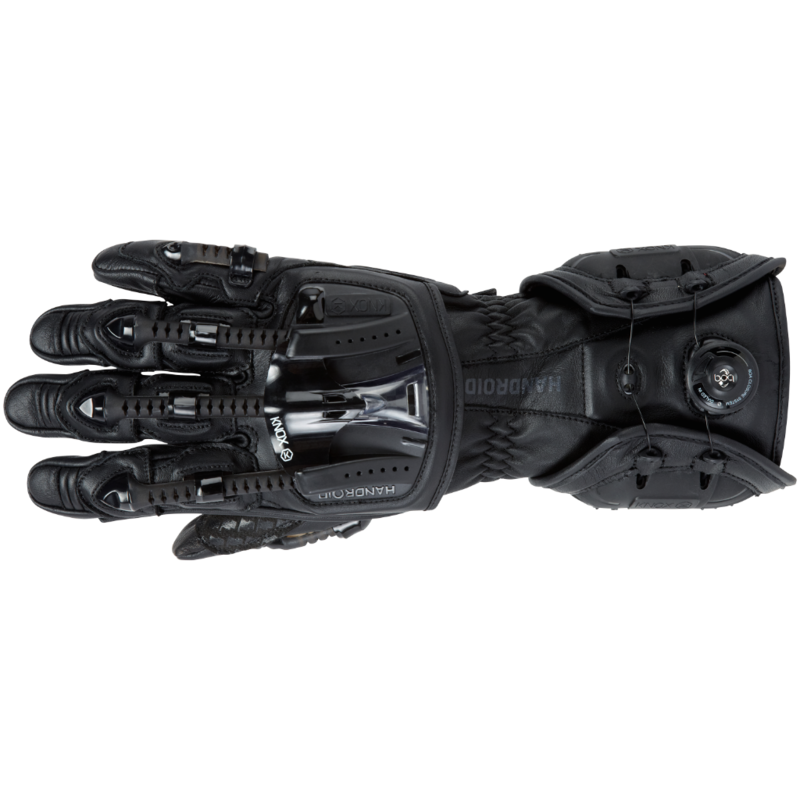 Knox have designed the Handroid to give the ultimate hand protection. I’ve crashed in these gloves and received no hand or wrist injury. What this crash does allow me to better review is the durability and Knox service. My biggest concern for these gloves was that they look like they could be a one-crash affair. With gloves always taking a scrape in any motorcycle crash near £170 is a lot to write off for every slide across the tarmac. 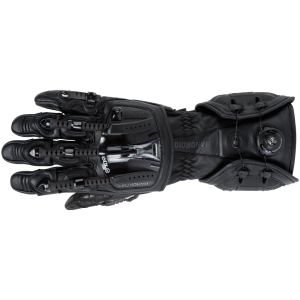 Completing the Boa gauntlet fastening mechanism is a Velcro on the inside of the wrist. During my crash this component was torn about a third of the way through and I felt required replacement. Knox advise any customer who has damaged their gloves to contact them via their website and send pictures so they can assess if the damage is economically repairable. Alternatively they can be sent the UK based company for a free quotation. The repair and return postage on my gloves cost £25 and was returned within the week, customer service was excellent and I couldn’t be more pleased with the service. The boa system is guaranteed for life through Knox and current turnaround on getting replacement system fitted in case of failure is also around one week. The other particularly flimsy looking part of the glove is the Aerofoil on the reverse of the glove, it reminds me of the Arai RX7 GP air wing. Luckily the foil on the Handroid is currently available free of charge from Knox and I’ve never lost or damaged mine in the months of use so far. £169.99 is a pretty competitive price point at the moment with the Handroid, Alpinestars GP Pro, Spidi Carbo 3, Dainese 4 stroke and Dainese Druid. On a spec sheet the Handroid arguably comes out top trumps with only the carbon fibre of the Spidi gloves holding a candle in the technology department against the Handroid. 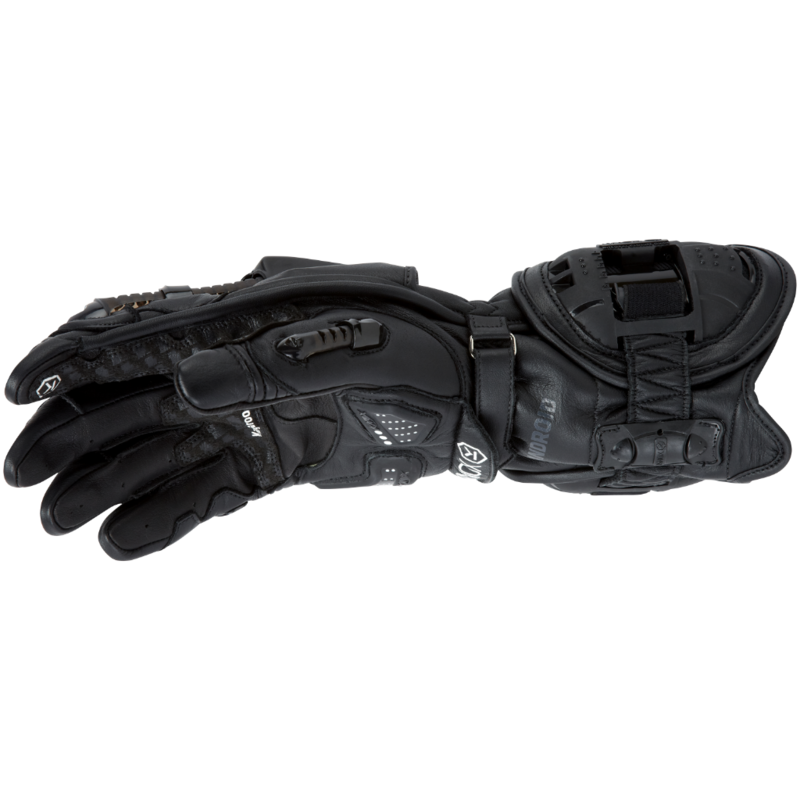 The Alpinestars are the only other option at this price point to feature the superior kangaroo leather palm. For the track I haven’t found a better glove than the Knox Handroid, they’ve replaced my previous favourite Alpinestars GP pro. For the road I find myself opting for less bulky options with the ease of use of a Velcro gauntlet. These gloves are well worth a buy for any racer, track rider or anyone who want’s maximum protection on the road without compromise.